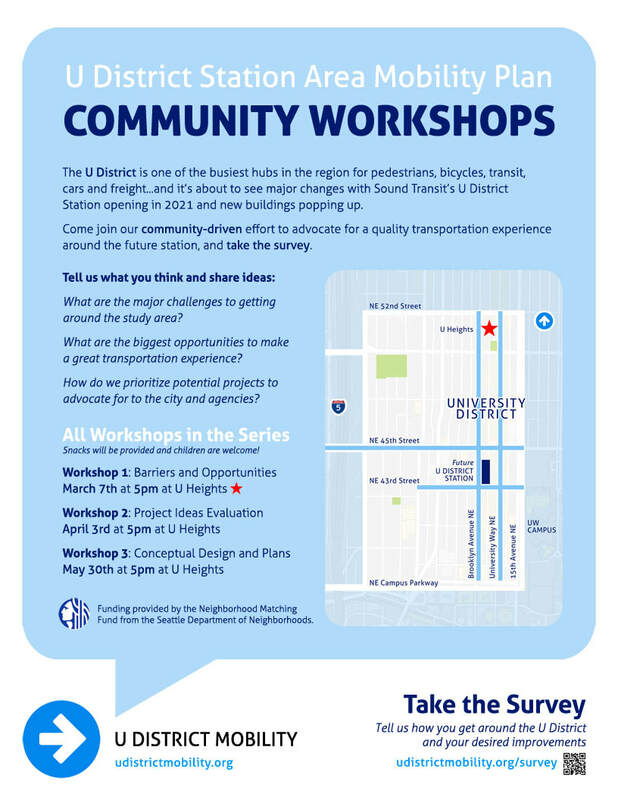 The U District is one of the busiest hubs in the region for pedestrians, bicycles, transit, cars and freight...and it’s about to see major changes with Sound Transit’s U District Station opening in 2021 and new buildings popping up. Come join our community-driven effort to advocate for a quality transportation experience around the future station, and take the survey. What are the major challenges to getting around the study area? What are the biggest opportunities to make a great transportation experience? How do we prioritize potential projects to advocate for to the city and agencies? Snacks will be provided and children are welcome! 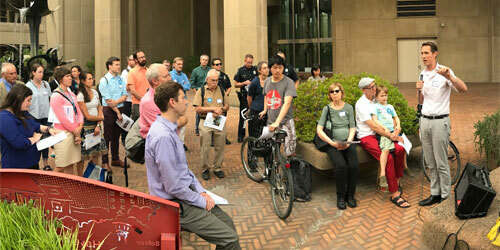 The U District Mobility Walking Tour: City Councilmember Rob Johnson speaking. ​More information on the tour. Spoke at the U District BIA meeting. Spoke at the Northeast District Council meeting on Feb 1st at 7pm @ Wedgwood Presbyterian Church. Presented to the local small business association with an invitation to participate in the project. Presented to our local community council with an invitation to participate. Speaking at the U District Partnership Board Meeting. Meeting was Tuesday, Feb 20, 11:30am-1:00pm. First Community Workshop in the U District Mobility project. Presentation to the University of Washington about the U District Mobility project and to hear feedback - First meeting. Monday, April 2, 2018 from 6:30-8:30pm at Ravenna-Eckstein Center. Second Community Workshop in the U District Mobility project. Seminar concentrating on walking as a mode of transportation in cities and city-regions, including social, cognitive, and perceptual dimensions of pedestrian movement and behavior theory, taught by Dr. Rachel Berney. 7pm at the University Lutheran Church. Presentation to Seattle's Transit Advisory Board and request for feedback on the U District Mobility project. Presentation to the U District property and small business owners about the U District Mobility Project - First meeting. Presentation to the U District property and small business owners about the U District Mobility Project - Second meeting. Presentation to the University of Washington about the U District Mobility project and to hear feedback - Second meeting.